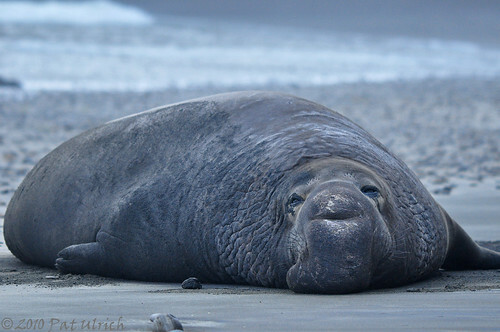 I'll begin my series of elephant seals from our weekend trip to Ano Nuevo State Reserve with a few shots that were taken right at the end of our terrific trip. 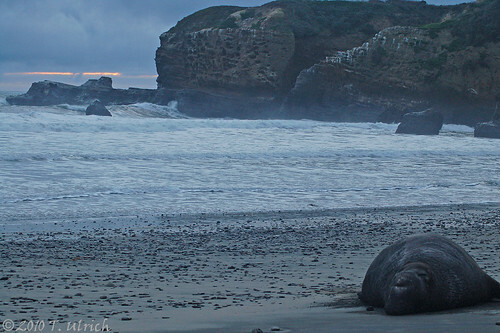 After our late afternoon tour we went back down to "Losers Beach" to spend the final minutes of light with some big brutes that usually camp out there. We had a chance to watch a younger guy displaying his toughness for a while, and as the last bit of light slipped out from behind the clouds and below the horizon I took a few final shots of this beast who was right near the stairs from the beach. My wife had a lens with a wider zoom range, and she took some wonderful shots of the seals as part of their environment. Here's one of my favorites, with the last sliver of sunset included. 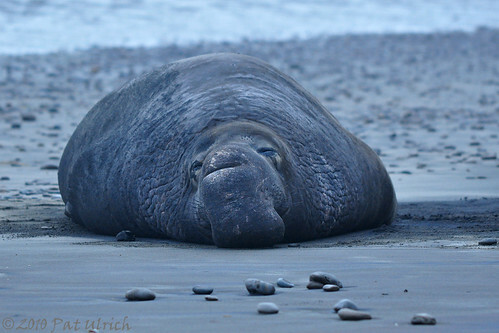 I've always wanted to photograph the elephant seals. Especially when it's competitive breeding season. I love seeing the young males tossing their weight around when it's out of season. They do that on ocassion during the winter where I am at the moment. Your wife did an awesome job capturing the moment. Can't wait to see more! Photographing these guys is a ton of fun, and its so easily accessible from the SF Bay Area. During the breeding season you have to be on a guided walk, but its only $7 and you end up spending maybe an hour or so with the seals. I've had some tour guides that don't get you too close, but this time we had a guide who was willing to bring us close to the 25 feet away limit, which is great for photography, and even more incredible just for the experience!